Entrepreneurs are committed, energetic, can-do people. That description can also fit your typical project manager, which makes sense because launching a business is a project. I’ve done it a few times, so I know. I cashed out of the biggest startup I built when it stopped being a project and started being a business. I see two big differences between a natural entrepreneur, and a skilled PM. The first is that entrepreneurs are in it to build a business—it’s the end point and the value that it creates which motivates them. I’ll come back to that point later. The second difference is that few entrepreneurs have training in project management. So, managing the project that is launching a new business can be a little haphazard! In this article, I’ll offer seven lessons from my own project management experience that are directly relevant to you, as an entrepreneur. If you know me and you think I’m going to begin by telling you that you need to first define what your startup project is, with precision, you’re spot on! But I’m going to go one further. It’s not just about having a clear goal and objectives. Take what you already have and ask yourself, “For what purpose am I doing this?” Take that answer and repeat it. At each stage, spend time also asking the question, “How else could I meet that purpose?” and come up with a list of new ideas. That will be a list of potential alternate projects that could deliver on the same purpose. Before you sink your energy, passion and possibly capital into your new startup, assess whether any idea on that list is a better way to meet your purpose. There’s a big part of me that wants to preach here. I’d like to advise you to build your new business for your customers, and not for your investors. But that’s presumptuous; it’s not for me to dictate that. And you may want to build it for yourself, or for a legacy. But what you must do is know who you are building your business for. Build it for yourself, for your staff, for your customer, or for your VC—but don’t try to build it for all of them. The competing needs and wants of different stakeholders will stretch you in too many directions. And, if you don’t snap, your fledgling business surely will. You can please all of your stakeholders some of the time. And you can please some of your stakeholders all of the time. But you will not be able to please all of your stakeholders all of the time. Related: What is Stakeholder Theory? A milestone is an event that happens at a single point in time. It has either passed, or it has not. There are no shades of gray, or “sort-of/maybes” about a milestone. Like your other best friends, a milestone will never lie to you. So, they are a great way to manage any project in an entrepreneurial business, where you need instant, easy, accurate information about status. They work well for product launches, performance tracking, and marketing campaigns. But there’s another reason why I think they are especially useful for entrepreneurs to manage their business: they are highly motivating. Each milestone is a measure of progress. And research by Teresa Amabile and Steven Kramer shows clearly that when we can see our progress conspicuously, we feel more enriched by the work we are doing. This is a powerful antidote to the common feelings that your startup has stalled, and there’s no point in carrying on. Any project manager will remind you the importance of a mature and active approach to evaluating and managing your business risks. So, take that as read. What I want to focus on is one specific source of risk: complexity. If you double the number of components to your project, you more than double the complexity. And therefore, the effort and also the risk. One easy way to reduce the risk in your entrepreneurial project is to modularize it into a number of small chunks. Managing the interfaces between these, but to a degree, by isolating each you will make your startup simpler and less risky. This is, of course, a strong argument for incrementalism. And, one of the biggest drivers for the growth of agile project management in the last 15 years has been its right and proper use in tech startups. Grow your business in chunks, meeting new demands as they emerge. And, as the familiar phrase says, don’t let the perfect be the enemy of the good. So, it sounds like I am, finally, a cheerleader for agile project management. But I’m not and never will be a cheerleader for one project management methodology over any other. Agile has a lot to offer us, and so does traditional, planned project management. What I will cheer for is a balanced approach that draws the best ideas, processes and tools from all sources, and finds the best combination for each circumstance. And you should never sacrifice the control that assertive project management can give you, over a dogmatic focus on agile methods. If you are not in full control of your spending, decision-making, schedules, resource allocation, and a host of other things, well, then you aren’t in control of your new business. Starting a business is fun. And it’s also hard work, mentally challenging and at time, stressful. And, as soon as you start hiring people, you acquire a new source of stress: your duty of care to look after your employees. Yet, not only is it tempting to put pressure on them, when times get tough, but it is also an inevitable consequence of human perception that the stresses you feel will communicate themselves to your team. The nature of empathy means that, if the leader we look to has a distinct emotional state (angry, joyous, or stressed) we easily find ourselves taking on those emotions too. And stress over a long period is harmful. It harms your emotional, mental and physical health. You need to deal with it in your staff, before you see a catastrophe. You understand the logic of that. So, by the same logic, you must also make sure you take care of your own physical, mental and emotional well-being. Be sure to get plenty of sleep, to eat well, to maintain sensible exercise regime, and to stay plugged in to the emotional support of your network of friends and family. Starting business is a brave step. But it is also a huge, exciting buzz. And no one skill set is going to be any more valuable than good project management. 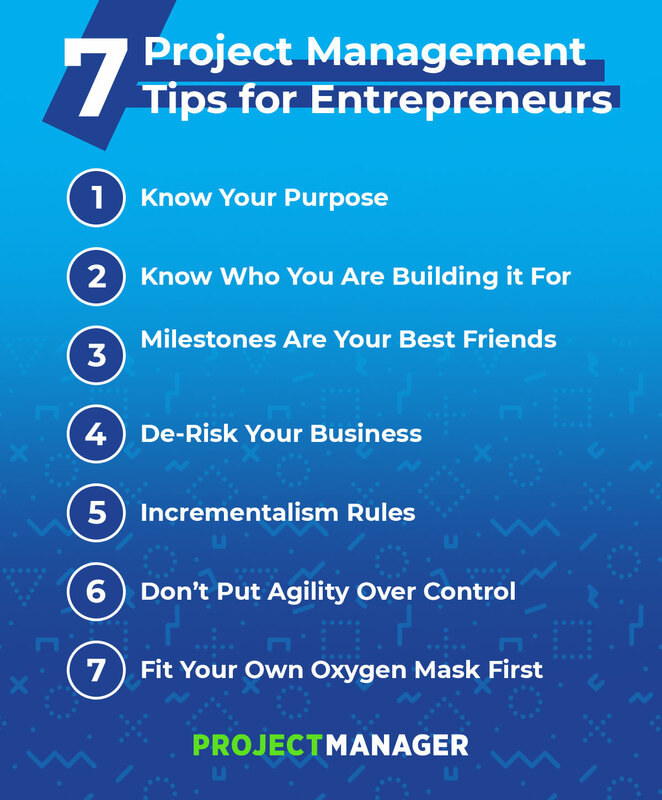 I hope these seven tips will lead you in the right direction. Yes, starting a business is a project. Entrepreneurs understand this and know that to manage that project successfully they need the right tools. ProjectManager.com is a cloud-based project management software that gives you real-time data and collaborative features to get everyone on the same page. Try it today by taking this free 30-day trial.